The newest Hearthstone set has finally been revealed! It will be The Witchwood, coming out mid-April 2018. 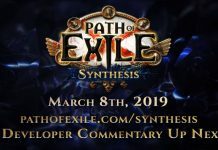 This set will launch with the Year of the Raven rotation. With this new set comes over one hundred new cards, two new keywords and a new adventure. 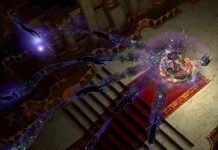 We’re still early in the expansion reveals, so we don’t know much yet. So far, there have been a handful of cards revealed which also reveals the gimmick of the set: even and odd cost cards. There are two new keywords: Rush and Echo. Rush is something we’ve seen before, albeit with a different face. It operates similarly to Charge, but cannot attack heroes the turn it enters play. This is exactly what is on the text of the cards Charge and Charged Devilsaur. 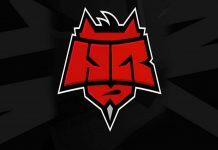 Blizzard have stated that they will not be modifying these older versions of Rush, which will lead to a lot of confusion down the road. Seriously Blizzard, sort your stuff out with phrasing. The other new keyword is Echo. This one is a lot more interesting, and I can easily see it making a big difference to certain decks. Echo says that when you play this card, a copy of it is added to your hand. This copy disappears at the end of the turn. This allows you to play as many copies of the card as you have mana to play them. You can now put a card in your deck that costs two mana, as well as four mana for two, as well as six mana for three, etcetera. Sure, these cards won’t be as strong as other two mana or four mana cards, but they fit your mana curve no matter what point in the game you’ve reached. 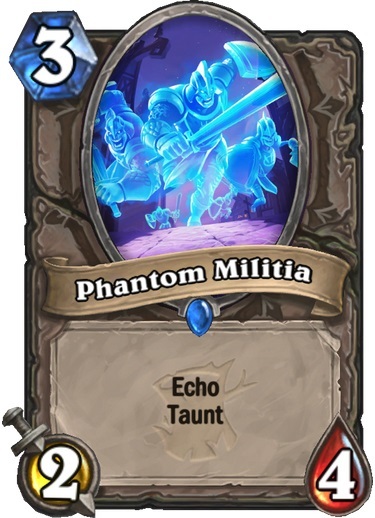 The one card revealed with Echo so far is Phantom Militia, a 2/4 with Taunt for three mana. For three mana, the card is very underwhelming. For six mana, two of them is even more underwhelming. And for nine mana, it’s sort of pitiful. But no matter what turn you draw it, you can spend all your mana playing it. If you draw it on turn three, you have a decent play. If you draw it on turn six it’s a hell of a lot better than just having a single copy. You get the idea. 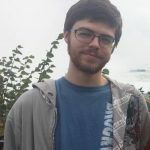 Weaker statlines for better playability. This is a huge change to traditional Hearthstone decks, and I hope to see more of it going forward. I’m very interested to see the other Echo cards from the set. The gimmick of this set is having a deck full of either even or odd cost cards. There are a handful of cards that have buffs for if you meet one of those two conditions. 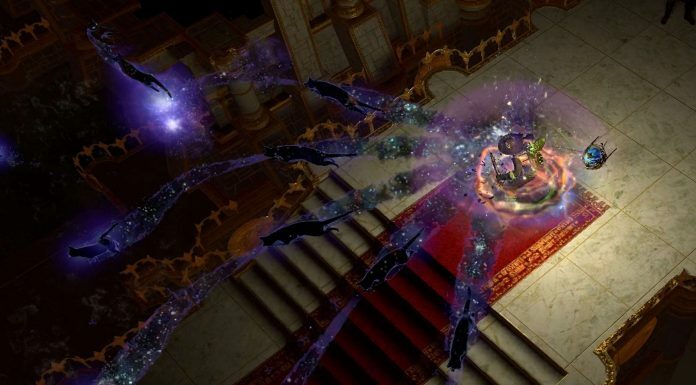 They have also revealed the legendaries for each condition. 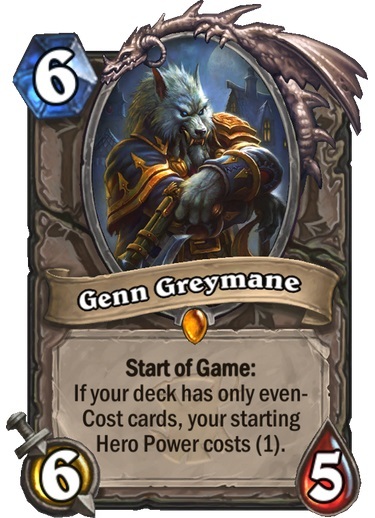 The even-cost legendary is Genn Greymane. He is a six mana 6/5 that says “Start of Game: If your deck has only even-Cost cards, your starting Hero Power costs (1)”. Wow. This is really interesting for a bunch of reasons. First, it’s a conditional card that comes into play right at the start of the game. It’s a Reno-style deck condition but instead, always active. Since being limited to only even-cost cards is a massive limitation, this is good. Second, the card itself is awful. You never want to play a six mana 6/5 so, ironically, you’ll never want to see Genn in your hand despite needing him in the deck. Lastly, it specifies “starting hero power,” so you won’t be able to do any Death Knight shenanigans with Genn. Is playing all even-cost cards worth having a hero power that only costs one? No, definitely not – yet. We need to see what other cards are revealed that match this theme. If there are a few of them, this could easily become worth it. Particularly in decks that want to hero power as much as possible. The great part about this is that on all your odd-mana turns, you can just hero power to round out your mana. For example, a Paladin would get a free 1/1 every odd-mana turn to compensate for having only even-cost cards. It will be very interesting to see the other cards in this set to deduce if this will be viable. 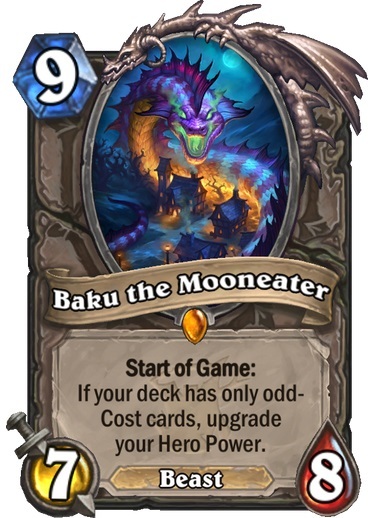 On the other side, we have Baku the Mooneater. Baku is the odd-cost legendary. He is a nine mana 7/8 that says “Start of Game: If your deck has only odd-Cost cards, upgrade your Hero Power”. Right off the bat, Baku is an absolutely garbage card to draw. You could rightfully assume that Blizzard thinks he is much stronger than Genn because Baku’s stat line is awful. In addition, you can’t round out your mana by using your hero power with Baku, so you’ll be floating one mana every other turn. We’ve already seen all the upgraded hero powers with Justicar Trueheart. If you don’t remember them, or didn’t play back then, here’s a full list. As you can see, they are very strong. But are they worth playing off-curve all game? Like I said, unlike Genn you can’t round out your curve with hero powers. A deck playing only odd-cost cards could have a much higher win rate with The Coin, allowing it to play on-curve for at least two of the early turns. Otherwise, playing off-curve can be very deadly in the early game. Similar to Genn, I would say that these hero powers are nowhere near strong enough to be worth this deck limitation – yet. We’re going to need to see the other cards from the set that have the same odd-cost deck bonuses. Again, I’m quite interested to see where this goes but my gut feeling is that Baku will be much less playable than Genn. Unfortunately, neither of these cards synergize with Death Knights, so there are a few existing decks that will lose out in a big way if you try to combine the archetypes. Still, I love seeing a deck-building challenge so I look forward to seeing if these two new archetypes become viable, particularly in competitive play. 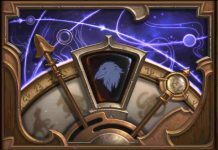 Previous articleThe Witchwood Released! And Already Broken!